Located in the historic town of Osuna on the campus of the Escuela de la Economic Social in Andalusia, the Synergia Summer Institute offers an intensive program of exploration, instruction, dialogue, and practical training on transition models for the realization of an ethical economy for people and planet. The Synergia Summer Institute applies the knowledge and practice of co-operation, economic democracy, political ecology, and the commons to address the central issues of sustainability and social wellbeing at local, regional and global levels. The overarching focus of the Synergia program is to answer the question: What is the ethical economy and how does it work in the context of ecological limits? The course will provide a critical overview of the contours of this new political economy and the mechanisms required for its realization. Pedagogically, the Synergia program seeks to maximize collaboration among participants, to promote relationships of dialogue, debate, knowledge sharing and learning, and to offer the broadest possible access and sharing of knowledge and resources. Above all, the course is designed to facilitate the application of ideas and learning to practical use. 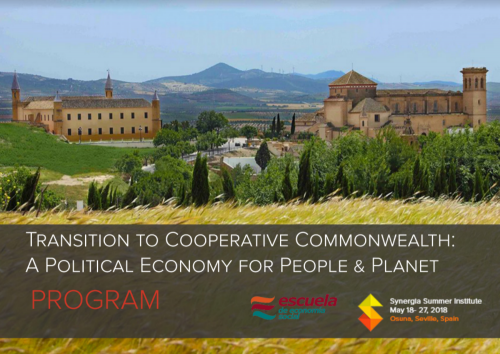 A key feature of the course is the blending of lectures and workshops with site visits to leading cooperatives and commons activities in Andalusia, home to some innovative examples of co-operative economic development in the world.